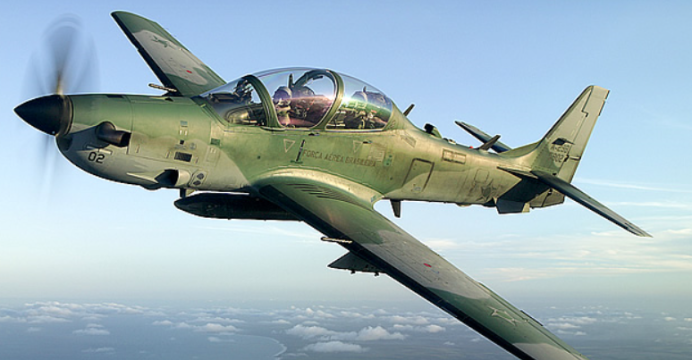 The U.S. State Department has greenlit a proposed $593 million U.S. sale of 12 Sierra Nevada Corporation (SNC) A-29 Super Tucano close air support (CAS) aircraft to Nigeria. Nigeria had sought the Super Tucano to bolster its COIN capabilities. However, the previous White House administration under then President Obama had reportedly been reluctant to sell arms to Nigeria (and other countries) due to concerns over human rights. President Trump has begun approving those sales. The SNC A-29 (i.e. Embraer EMB-314) is a relatively popular turboprop-powered counterinsurgency (COIN) platform. Powered by a single Pratt & Whitney PT6A-68C, the Super Tucano can reach a maximum speed of 590 km/h and flight ceiling of 35,000 ft. It can also carry 1,500 kg in ordnance, such as laser-guided bombs, through five external hardpoints. The Nigerian Air Force’s (NAF) to bolster its COIN and CAS capabilities also involve the procurement of 12 Russian Helicopters Mil Mi-35M attack helicopters. The NAF has taken delivery of two Mi-35Ms in January and is scheduled to receive the remaining 10 in 2018. The NAF is also modernizing its fast jet fleet with the acquisition of three JF-17 Thunder multi-role fighter aircraft from Pakistan Aeronautical Complex (PAC). Nigeria’s 2016 federal budget allocated a payment of $15.88 million for the JF-17s. Its 2017 budget proposal lists $68.76 million for “platform acquisitions … for counter air, counter surface, air ops for strategic effect and air support operations.” These appear to be annual installments for various platforms (i.e. A-29, Mi-35M and JF-17). Sub-Saharan Africa has emerged as a lucrative market for turboprop-powered attack aircraft. Nigeria is in fact following Angola, Burkina Faso, Ghana, Mali, Mauritania, Mozambique and Senegal in ordering the A-29. In January, the U.S. also approved a $418 million sale for 12 Air Tractor AT-802L to Kenya. Most of these countries have limited to non-existent air defence requirements. However, low-intensity conflict and general air policing still require them to maintain air assets in some form, be it for intelligence, surveillance and reconnaissance (ISR) or CAS. Turboprop-powered platforms such as the A-29 promise low operating costs with effective ISR and air-to-ground capabilities, especially in low anti-air warfare (AAW) threat environments (e.g. against insurgents without short-range surface-to-air missiles). The rise and pervasiveness of these lightweight platforms has contributed to a bifurcation in the modern fighter market between lightweight trainers re-purposed for attack roles and medium-to-heavyweight multi-role fighters. Many of the A-29, AT-802L and Archangel’s users have traditionally operated entry-level jet fighters, such as the MiG-21 and F-5E. However, those facing limited airborne threats have increasingly opted to retire their jets and pivot entirely to turboprop attack aircraft. This precludes new entry-tier jets, such as the JF-17 Thunder, from accessing these legacy MiG-21/F-5E markets.